The MDA Library Passenger Pigeon has returned home. Fully cleaned and restored, it is now on display in the library. Two thousand fourteen marked the centennial of the death of Martha, the last known Passenger Pigeon (Ectopistes migratorius), who died in the Cincinnati Zoo on September 1, 1914 at the age of about 24 years old. 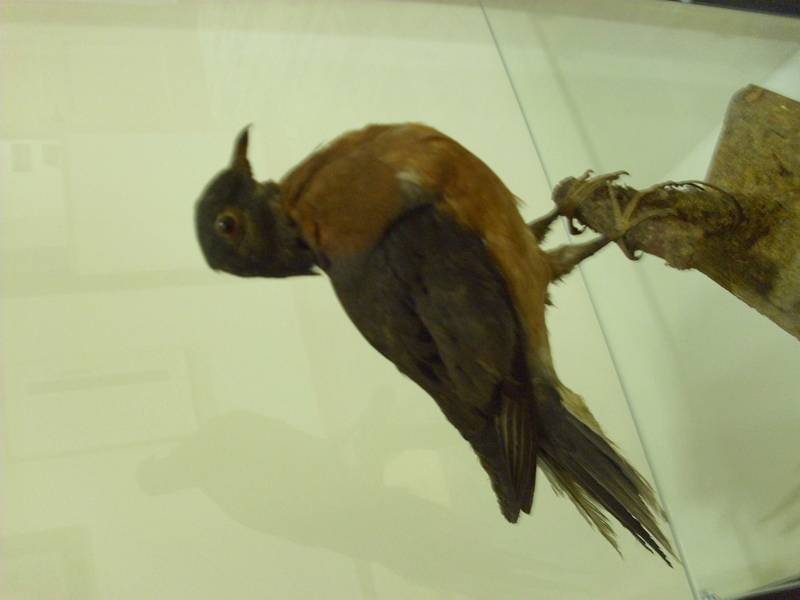 The Passenger Pigeon displayed at in the Mollie Dodd Anderson Library is the most valuable and unique specimen in the George School Science Department’s small collection of mounted bird specimens. Once numbering 216 mounted birds in 1903, George School’s collection came from Dr. Joseph Thomas of Quakertown, Bucks County and the estate of Samuel Janney of Philadelphia. It is unknown which collection the Passenger Pigeon originally came from but the bird is probably about 130 to 150 years old. Named after the French word passager for “passing by”, it was once the most abundant bird in North America, and possibly the world, numbering around three to five billion individuals. The species lived in enormous migratory flocks until the early twentieth century, when hunting and habitat destruction led to its demise. The passenger pigeon was one of the most social land birds. It lived in colonies stretching over hundreds of square miles and practiced communal breeding with up to a hundred nests in a single tree. The bird was nomadic and had no site fidelity, often choosing to nest in a different location each year. Pigeon migration, in flocks numbering billions, was a spectacle without parallel. Its diet varied greatly and depended on the season. In the fall, winter, and spring, it mainly ate beechnuts, acorns, and chestnuts. During the summer, berries and softer fruits, such as blueberries, grapes, cherries, mulberries, pokeberries, and the fruit of dogwoods, became the main objects of its consumption. It also ate earthworms, caterpillars, and snails, particularly while breeding. It has been stated that Passenger Pigeons were still being seen in Bucks County until the 1870s. In fact, a March 1921 article in the George School Ides states that the “woods a half mile southeast of Newtown were a favorite feeding ground” – not far from this display case. The last fully authenticated record of a wild Passenger Pigeon was recorded near Sargents, Pike County, Ohio, on March 22 or 24, 1900.